Senate president Bukola Saraki’s statement on the 2023 presidential ambition of the National Leader of the All Progressives Congress, Asiwaju Bola Tinunu attracted diverse reactions on Tuesday. Saraki had on Monday said Tinubu was supporting President Muhammadu Buhari’s re-election with the hope of succeeding the President in 2023. He said Tinubu told him he would support Buhari even on a stretcher. Saraki spoke in reaction to a statement on Sunday by Tinubu, alleging that the Senate president dumped the APC because of his presidential ambition and selfish quest for power. The National Publicity Secretary of the All Progressives Congress, Mr Yekini Nabena, in an interview with The Punch, indicated that it was premature to talk about 2023 presidency, adding that Tinubu’s presidential ambition had not been communicated to the party. 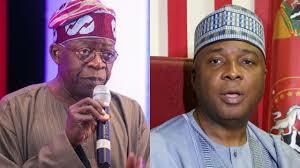 Commenting on the exchange of words between Saraki and Tinubu, the Yoruba socio-cultural association, Afenifere, expressed dismay over what it identified as the elevation of personal interests and ambitions over national good and development by politicians in the country. It noted that the verbal exchanges between the APC leader, Bola Tinubu, and Senate President Bukola Saraki were all about their personal interests. Afenifere spokesman, Yinka Odumakin, expressed disappointment that the two men were more interested in personal ambitions than in national good and progress. “You cannot see anything in these exchanges that talk about national good or higher values. The only thing that was substantial was when Saraki said he was against Muslim-Muslim ticket in 2014. If that was true, it would have been unthinkable in a Nigeria so badly divided as it is today. Clearly, the arguments were about personal interests and ambitions,” Afenifere noted. But a Kano State delegate to the 2014 National Conference, Dr Junaid Mohammed, said there was nothing wrong with Tinubu or anybody for that matter being ambitious. He stated he would not quarrel with politically-ambitious people so long as the process of actualising their ambition would not lead to collateral damage that could ruin the country. Mohammed made his view known in a telephone interview with The Punch in Abuja on Tuesday. The medical doctor-turned politician said, “Unlike Bukola Saraki, I do not blame anybody for being ambitious as long as the process of achieving the ambition doesn’t create so must collateral damage that will be harmful to the country. I don’t have any problem with it. Speaking about Tinubu’s statement which led to Saraki’s response, Mohammed said, “I don’t know if the information he has as regards either Buhari himself, Tambuwal or Bukola Saraki for that matter is necessarily 100 percent reliable. “Let me state for the records, Tinubu is my friend and I would not take issue with people I consider my friends publicly. “Having said so, I must admit that some of his criticisms in defence of Buhari, the APC and even Adams Oshiomhole, who was until recently a persona non grata to him, is something I find rather amusing and somewhat a little surprising. But a chieftain of Afenifere, Chief Ayo Adebanjo, says the APC leader must be naive to think that the North will allow him to succeed Buhari in 2023. Speaking with The Punch on phone on Tuesday, Adebanjo said, “Tinubu is daydreaming if he thinks the North will ever support his presidential ambition. We have our principles. Attempts to get a reaction from Tinubu’s Media Adviser, Mr Tunde Rahman, to Saraki and Adebanjo’s statements were unsuccessful. Calls to his mobile telephone number were neither picked nor returned.